(L) LGU officials in Buenavista Marindque (R) Marinduque Provincial Government officials. BOAC- The Department of Social Welfare and Development (DSWD) MIMAROPA held series of orientation on Data Privacy Act (DPA) as part of the mandatory Listahanan data sharing agreements to local government units (LGUs) in Marinduque. Listahanan is a government mechanism that identifies who and where the poor are nationwide, where the result of the 2015 nationwide household assessment is available and accessible to social protection stakeholders. “With the passage of the data privacy act, DSWD established a systematic way of sharing data to safeguard personal and sensitive personal information of households in the Listahanan list,” said Regional Coordinator Ernie H. Jarabejo. RA 10173 or Data Privacy Act of 2012 protects individual personal information stored in the information and communications systems of government and private sectors. It aims to protect the fundamental human right to privacy while ensuring a free flow of information to promote innovation and growth. For requests covering personal information e.g. list of names and addresses of Listahanan identified poor, the Memorandum of Agreement between the stakeholder and the DSWD is required, added Jarabejo. However, for the statistical data request, a Letter to the DSWD enumerating the data needed and its purpose is required. Also in this act, stakeholders requesting access to the list of poor are required to designate Data Protection Officer who shall plan, implement, and evaluate policies for data privacy and security, Jarabejo concluded. The DPA orientations were attended by office heads of the Marinduque Provincial Government and Municipal Government of Buenavista. To date, the local government of Boac has successfully complied with all requirements in the Listahanan data sharing among the six municipalities in Marinduque. Sablayan, Occidental Mindoro—As a celebration of the 4th National Community Driven Development month this June, DSWD Kalahi CIDSS MIMAROPA together with the LGU of Sablayan conducted an activity called “Pamumunong Makamasa” this June 26, 2018 in the town of Sablayan, Occidental Mindoro. The activity aimed to show the close coordination of the community and the LGU of Sablayan and to discuss the effectiveness of using the CDD strategy of Kalahi CIDSS in local governance. Different department heads of Sablayan that constitutes the Municipal-Inter Agency Committee (MIAC) including Mayor Eduardo Gadiano, Municipal Planning and Development Coordinator Muriel Reguinding, Municipal Engineer Alfredo Sarona, Budget Officer Fe Santos and community volunteers of Kalahi CIDSS Barnagay Sub-Project Management Committee (BSPMC) Chairperson Chritian Pedrozo, Project Implementation Team (PIT) head Carmela Marisga, and Brgy. Treasurer Gina Obtinalla participated in the activity. Hon. Eduardo Gadiano sign his pledge to support the campaign towards institutionalization of the CDD process. A Focus Group Discussion (FGD) was conducted after the activity wherein they shared the lessons they have learned from their counterparts. Mayor Gadiano shared his thoughts as he said in the discussion “kayang ma institutionalize ang proseso ng CDD sa kahit anong class ng munisipyo kung gugustuhin ng LGU dahil yung proseso ng participative process ay mahalaga para matukoy talaga yung pangangailangan ng isang bayan.” The discussion was proceeded with a signature campaign to adopt and institutionalize CDD on local governance in MIMAROPA. Through time since its inception, DSWD Kalahi CIDSS MIMAROPA encourages local government units in the MIMAROPA region to adopt/institutionalize the CDD strategy in their governance strategy. The Municipality of Sablayan is one of the first municipalities in the country and the pioneer in MIMAROPA to institutionalize the principles of CDD in their governance and development strategy. 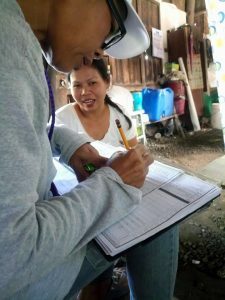 MALATE, Manila- The Department of Social Welfare and Development (DSWD) has completed field validation of Listahanan-identified poor households for the Unconditional Cash Transfer (UCT) in Mindoro, Marinduque, Romblon, and Palawan or (MIMAROPA) provinces. From the 93,436 household targets, 92,205 households or 98 percent are validated and verified regionwide. The UCT household validation spearheaded by DSWD- Listahanan started on the second week of March and was officially completed last week of April 2018. A total of 22,981 households has been validated in Oriental Mindoro; 17,594 in Occidental Mindoro; 6,319 in Marinduque; 7,777 in Romblon; and 38,103 in Palawan. The Department has hired 392 validators in MIMAROPA who have administered house-to-house interviews for 45 days. “From the number of nonvalidated households are those unlocated, transferred to other provinces or regions, vacant, and in some cases no available qualified respondents,” said Listahanan Regional Coordinator Ernie H. Jarabejo. According to validation guidelines, to qualify as respondents they should be at least 15 years old above, member of the household to be validated, and able to verify the accuracy of the household information or profile. Jarabejo stressed that hired validators have exhausted all possible means to locate and verify those missing households as not to be left behind before the barangay issues certification attesting cases of unlocated or transferred. Moreover, the barangay council also issued a certification of completion testifying that validation activity in the area is successfully conducted based on standard protocols. The UCT validation is a mechanism to identify possible and qualified recipients of cash grants as a government’s mitigating measure on the effect of the new Tax Reform for Acceleration and Inclusion (TRAIN) law. “The said validation aims to assess possible recipients of social welfare cash assistance to poor families who are heavily affected by the increasing prices of basic commodities due to the TRAIN law. Priority targets are non-Pantawid Pamilyang Pilipino and Social Pension Program households,” added Jarabejo. Meanwhile, DSWD clarifies that the household validation aims not to delist, select and expand new and current Pantawid Pamilyang Pilipino Program and other program partner-beneficiaries. As of this writing, all validated forms will be encoded for updating of the household profile.